It is impossible to be bored in Italy. To excite, delight, and stimulate you there is the beauty of the land, the elegance and charm of its people, the variety of its regional cultures, the richness of its food and wine, the quality and dash of its design and engineering, the reputation of its artists, sculptors, writers, musicians, filmmakers and, above all, the glory of its monuments and architecture. Like all the Culture Smart! guides, this book focuses on the people. How do they behave, and what makes them tick? What is the best way to get on good terms with them? For that is the real way to enjoy Italy. Above all other European nations, the Italians epitomize style. Fare bella figura —“to look good, to make the right impression”—is a social imperative, not a fashionable option. Like the other titles in this series, Culture Smart! Italy shows you how to get the best out of being in Italy and meeting and working with Italians. It tells you what you need to know about its history and culture and gives you a platform for further investigation of this fascinating country. It shows you how the Italians go about their daily lives, and highlights some of their passions and preoccupations. It introduces their festivals and traditions. 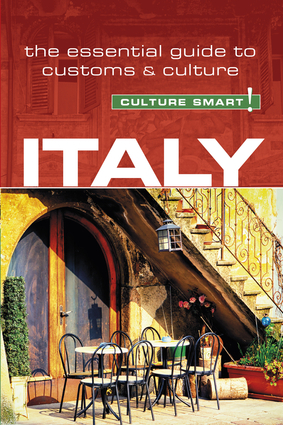 It suggests how to have a good time in the Italian way, and gives tips on how to travel around. It offers a guide to communications, including communicating successfully with Italians in a business situation. No one is in a hurry when eating out in Italy. The interval between the secondo piatto and the cheese and fruit, followed by dessert and coffee, is the time for leisurely conversation and may easily add an hour to your meal.